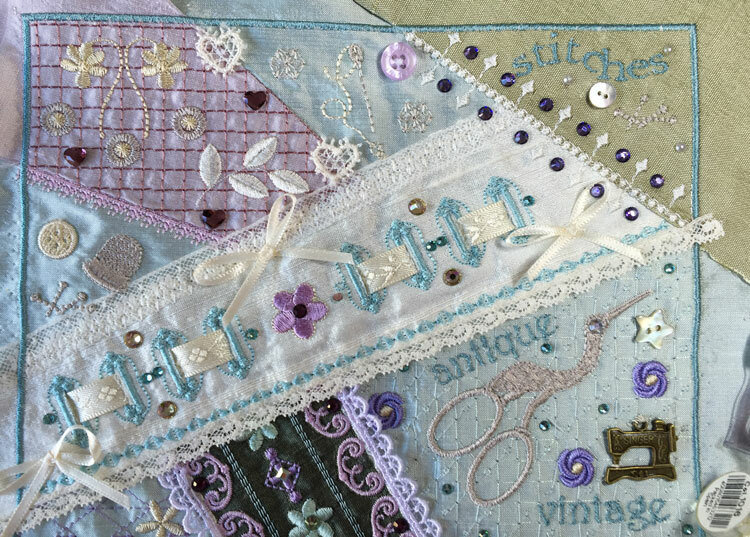 Over the last few weeks I have been perfecting the second vintage sewing crazy quilt and preparing the detailed PDF tutorial on how to stitch it out and get the very best results. 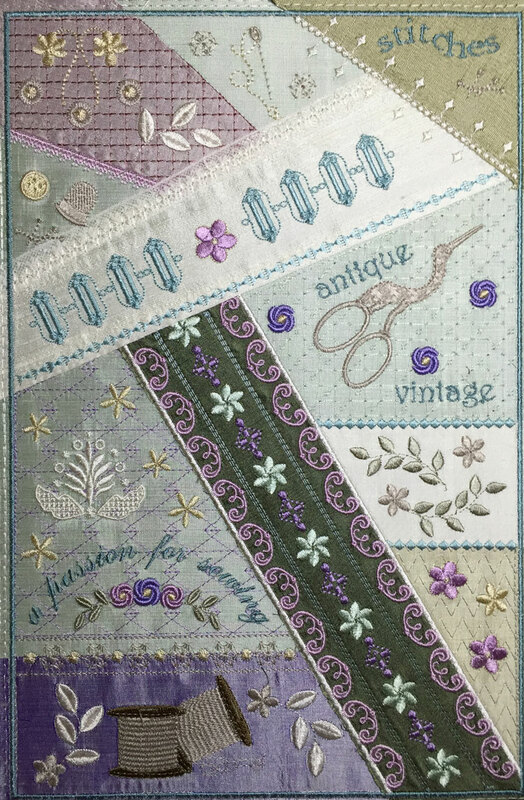 This crazy quilt is now available and I want to share details of the last sample I have created with these fabrics and threads. Many of these pictures speak for themselves. I recently invested in a little steam iron that allows me to press the sections as I go within the hoop. Search online for the Pyrm mini steam iron which is so handy to have for quick pressings. I use a fabric glue to hold them in place too, and if the results are not good I unpick and attach them again. Trim as close as possible to the stitches so they are hidden under the embroidery. Looking at these purple motifs I remembered that I had some square crystals which would be perfect to embellish them with. As they are AB ones they will pick up the colours around them. 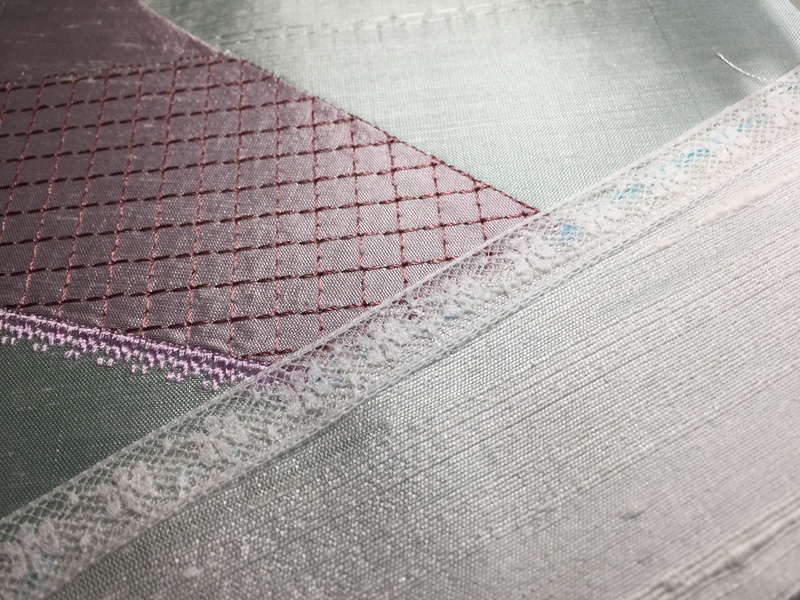 Using lace over the raw edges works perfectly on this join, but you need to attach it temporarily with fabric glue to hold it in place for the zig zag stitches. It is surprisingly difficult to get the lace aligned so I have added treble guide lines. 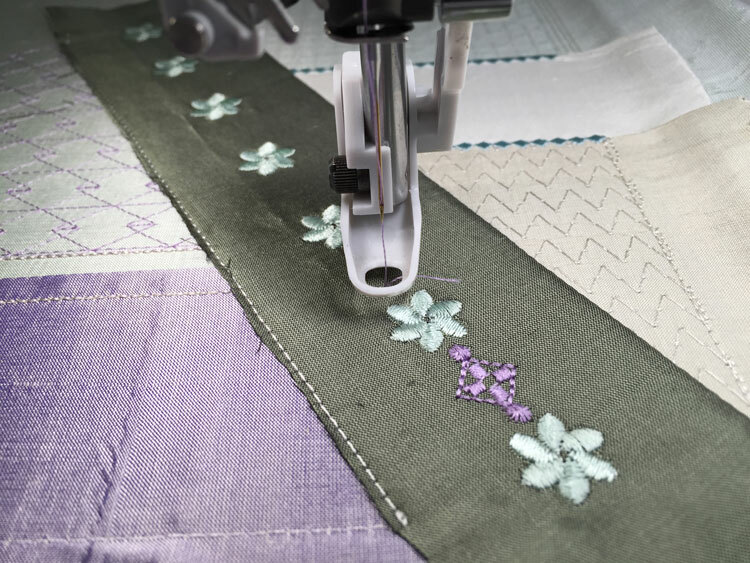 Obviously you need not stitch out all these motif fills, or you could add your own to the fabric pieces before application by using the inbuilt stitches on your machine. 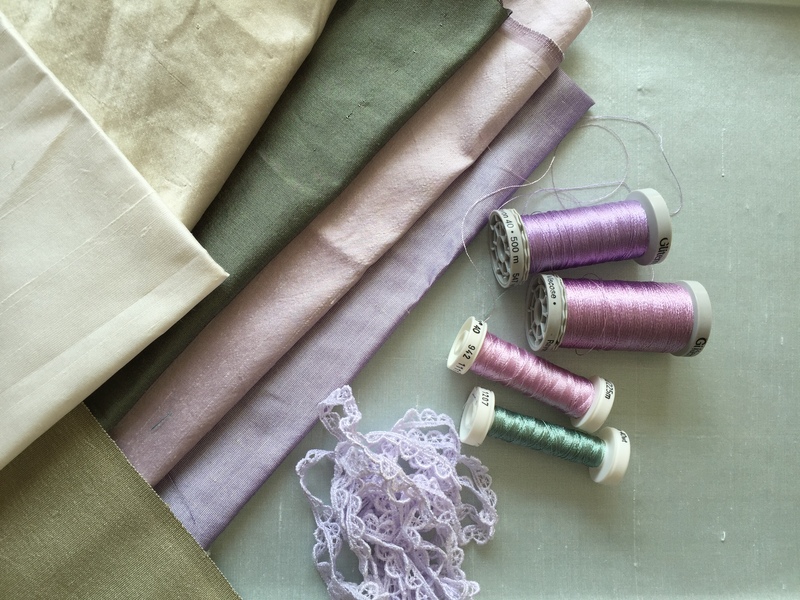 I think it is best to use a thread near to the same shade as the fabric. There a few digitising errors in this stitch out which have been perfected. 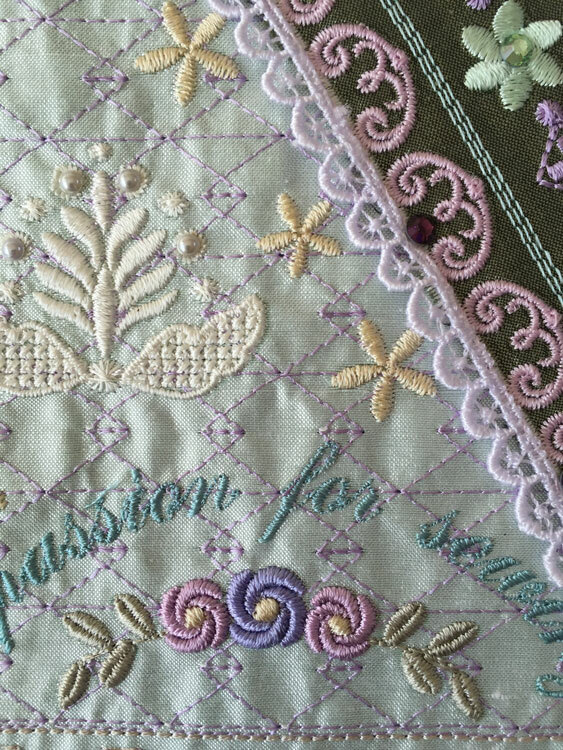 Some stitches disappeared from the pale jade motif fill on the right, but that has been rectified. I was delighted with the effect that metallic thread gave to the fabric though. Notice the crease in the mauve silk at the bottom. Once badly creased or folded it is nigh impossible to remove such creases from silk, but they can be hidden under embellishments if you are determined to use your silk remnants. Now to add the first stage of embellishments! These hearts are a little more of a challenge to attach. I lay mine in place and hold my heat tool over them counting slowly up to about twenty. This saves time changing the heads. I have added satin ribbon to the buttonholes but lace works just as well. I love the little Singer sewing machine. 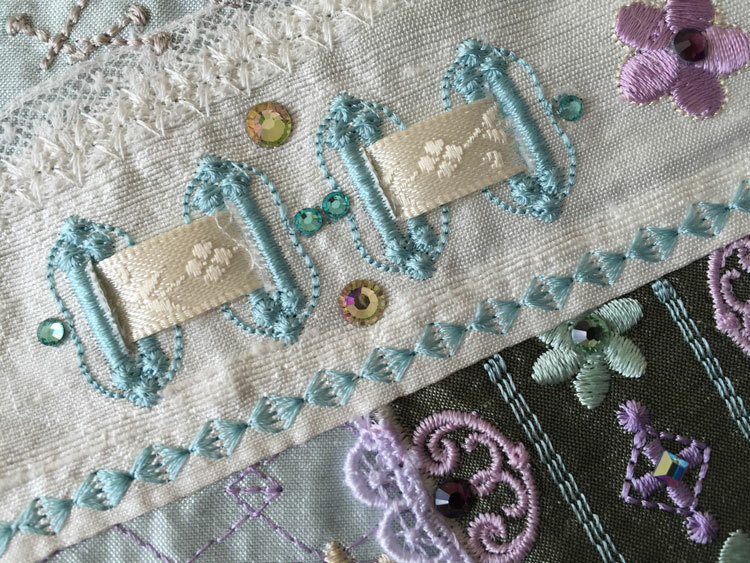 Tiny lavender pearls have been added to the white embroidery below. 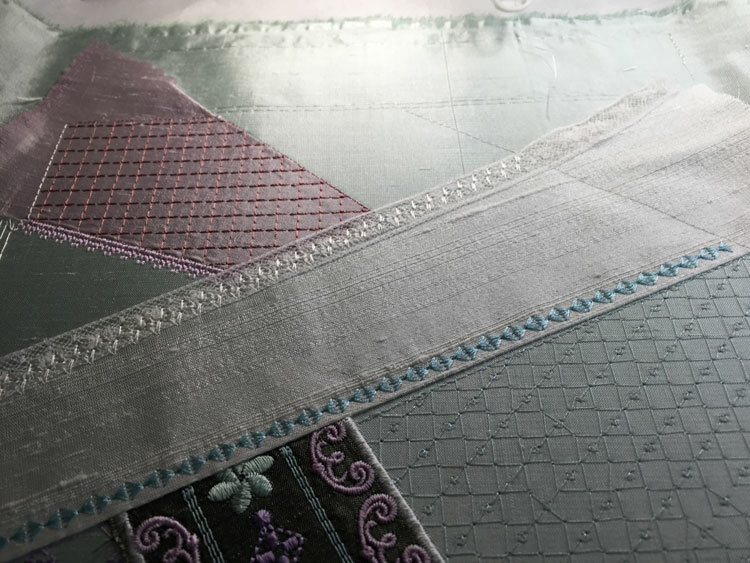 As you can see I have hand sewn the pale mauve lace along the edges of the panel which disguises any imperfections that you are not happy about. 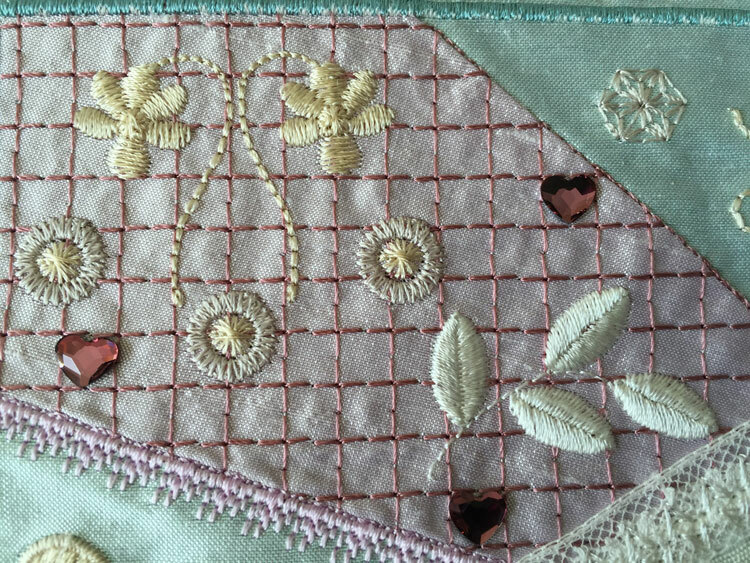 Even the tiniest of lace is useful and I sometimes cut the little hearts, flowers and motifs off lace to use individually. 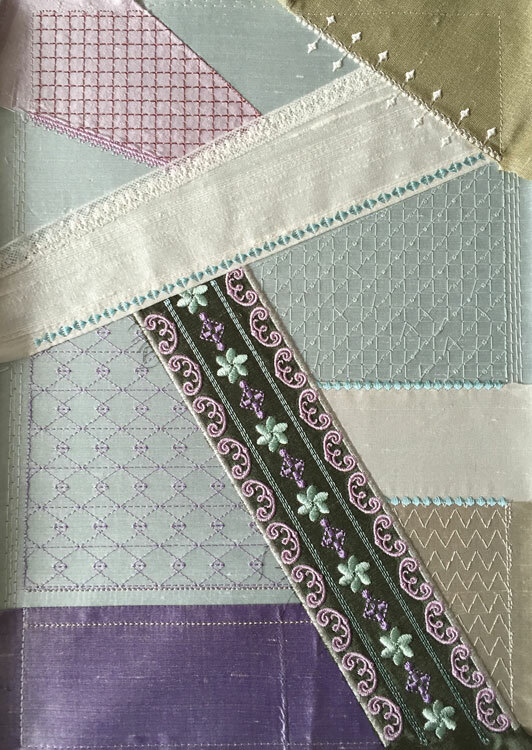 A few hand tied bows of narrow satin ribbon will add a little dimension to this part of the quilt block. 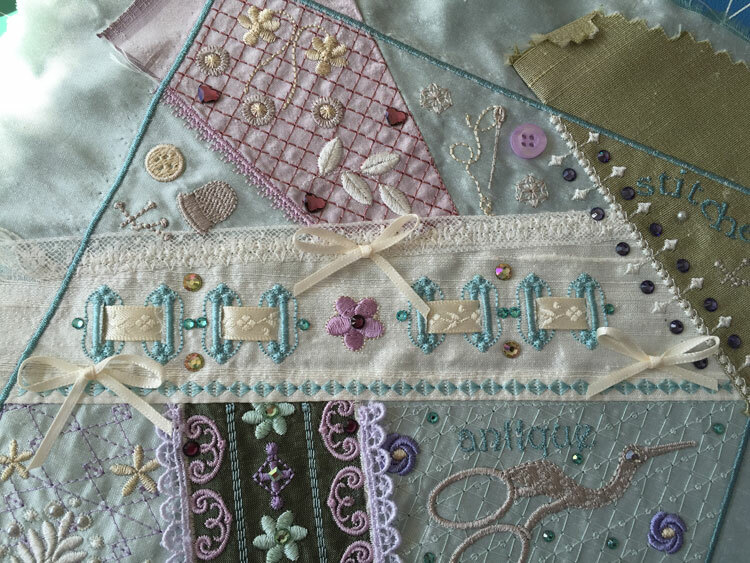 Most of the colour planning went well for this crazy quilt, although the row of embroidery should have been a different colour from the buttonholes. Not altogether sure about the sage green block on the top right. If you need some pieces of silk dupion visit The Silk Route, a website that sells all sorts of wonderful silk including some theme packs. It is full of useful information about silk too. 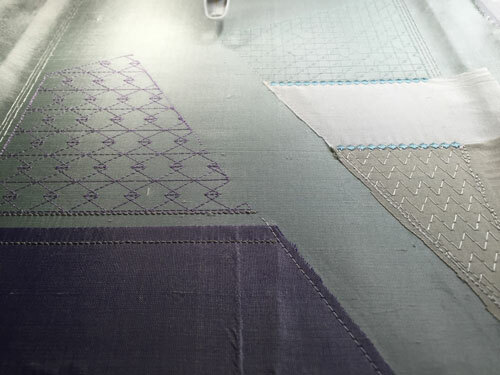 Silk is wonderful for crazy quilting as it is easy to trim the raw edges. Once your embroidery is complete any edges peeping out can be pulled away or snipped. After all the care I take to get the finished embroidery free of puckers some always appear during the embellishing process. I checked all the photos on my Pinterest board and it seems commonplace. I have never considered hooping the finished block for the hand sewing and wonder if anybody does this. Certainly something to consider for next time. 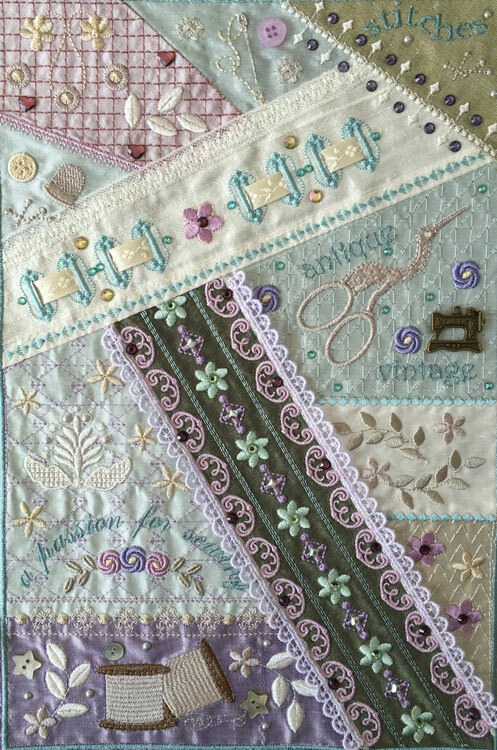 By the way do let me know of any websites that sell crazy quilting accessories as once you have succumbed to this addiction you can never have enough embellishments. So many of them are just a little too big for my liking and tiny buttons are very difficult to come by. Now I see just a few more gaps, and have started some beading… and so begins the second stage of embellishment. Knowing when to stop can be difficult but I don’t add too much as this tends to hide the embroidery and distort the fabric! You will be pleased to know that I have already started my next crazy quilt and this one will be circular. 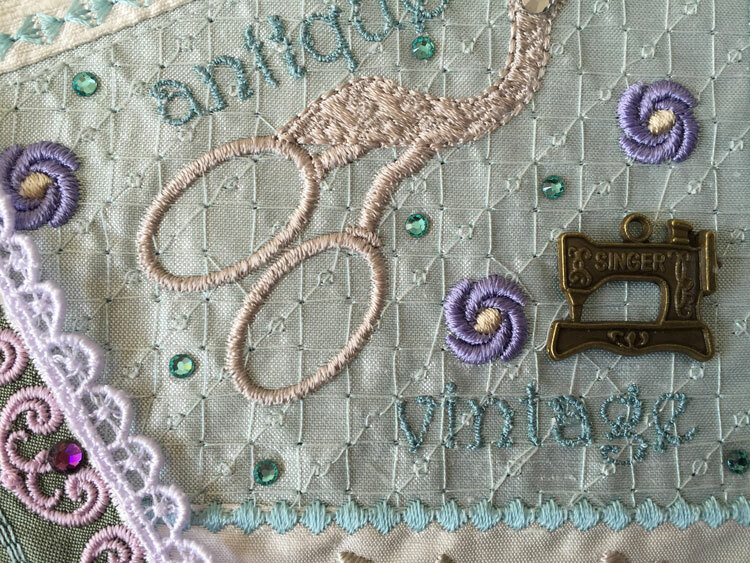 I am also thinking about doing a couple of design sets featuring the elements that can be found in my two vintage sewing blocks. Let me know if you are interested. 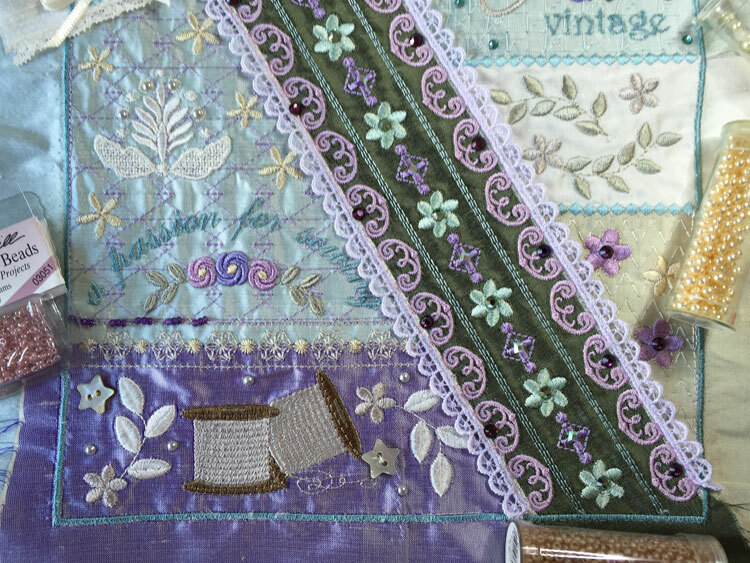 This entry was posted in Discussing machine embroidery, Embroidery projects, New Designs and tagged Crazy quilting, Crystals, Embellishment, embroidery on silk, machine embroidery, The importance of colour. Bookmark the permalink. I absolutely love these!! I like the sage green it seems to give it an anchor/frame point. Question for you how to finish to use as a very small decorative piece in itself without making a whole quilt. I have layered the blocks with batting and some lining, stitched around leaving an opening, and turning right side out, placing it on my wall in my studio. Attach to a cushion or tote bag. I have seen the blocks used as hot water bottle covers, journal covers and table runners. Hope that gives you a few ideas. So lovely adore you work! !